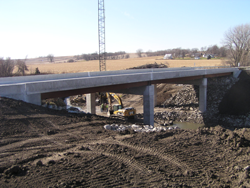 The US Highway 6 Bridge over Keg Creek outside of Council Bluffs, Iowa is a demonstration bridge site chosen to put into practice newly-developed Accelerated Bridge Construction (ABC) concepts. One of these new concepts is the use of prefabricated high-performance concrete (HPC) bridge elements that are connected, in place, utilizing advanced material closure-pours and quick-to-install connection details. The Keg Creek Bridge is the first bridge in the US to utilize moment-resisting ultra-high performance concrete (UHPC) joints in negative moment regions over piers. Through laboratory and live load field testing, performance of these transverse joints as well as global bridge behavior is quantified and examined. The effectiveness of the structural performance of the bridge is evaluated to provide guidance for future designs of similar bridges throughout the US.